I didn't take this photo, obviously! 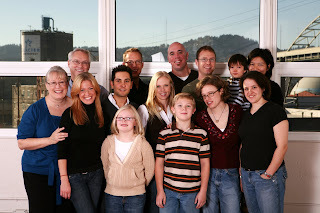 This is from our family gathering the first week in December, 2007. It was the first time everyone in the family got together in one place in three years. The photo is copyright Shawn St. Peter Photography. The guy is a monster in photo work for groups, IMO. For grins, look through his website; I especially admire his work with musicians.